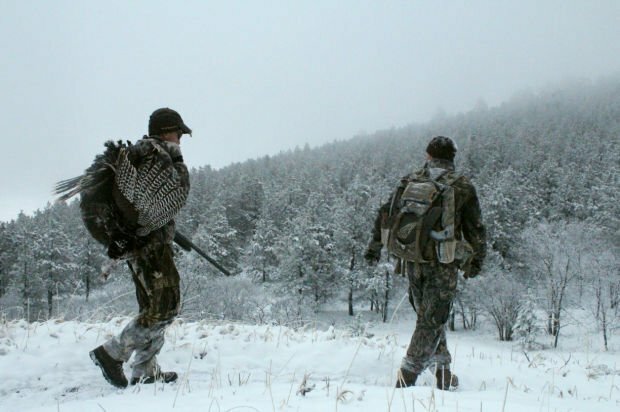 The author’s husband, Josh Peterson, left, and Sundance hunter Brian Sebade, right, walk out of the Black Hills National Forest in 2014 near Sundance after a successful hunt. Brooks Even, 8, poses with a turkey he shot in Nebraska. His dad, Lander teacher Zach Even, is an avid archery hunter who killed a turkey this year with a recurve bow. A deer looks at a turkey decoy near a blind occupied by Lander resident Zach Even. Even uses hen and jake -- or young male turkey -- decoys to attract bigger adult males. Lander hunter Zach Even poses with a turkey he shot recently in Nebraska with his recurve bow. Archery turkey hunting is challenging, and using a recurve bow is even more difficult. The first year I went turkey hunting I wasn’t carrying a gun. My husband and good friend were filling tags; I was along to learn. We climbed a hill in the Black Hills outside of Sundance, called back and forth with a tom and watched as he strutted in. My husband shot, hit, and we were back down the mountain in time for breakfast. I’d spent years on elk hunting trips with varying levels of success. Public land turkey hunting, I figured, must really be that easy. That was the spring of 2014. I bought my own license the next year and went out hoping to connect with a bird but lacked the confidence. I was never close enough to shoot. In 2016, I had more confidence – I’d successfully hunted pheasants and ducks and had been more intimately involved in big game hunts. But it still didn’t quite work. The 2018 season followed a similar thread. The precious weekends we had to turkey hunt were full of beautiful, foggy mornings, eerie silence and distant calls, but never a turkey for me. Each friend and family member who visited connected. I never fired a shot. When 2018 came, I thought it would be my year. We had spots with turkeys. We were better at calling. I had practiced shooting. And yet another season went by without punching my tag. In my defense, I decided early on I wanted to call a turkey in – not shoot one walking off someone’s rural farm oblivious to the shotgun-carrying humans nearby. I also wanted to hunt public land. And for the last three seasons, we’ve had a camouflage-clad baby and then toddler in tow. But even with those caveats, clearly I have been doing something wrong. This year, I went to the experts. Joe Sandrini, the Wyoming Game and Fish Department’s Newcastle biologist, and Zach Even, an experienced archery hunter in Lander offered their tips on how to help someone like me, and possibly you, connect. Try early and late: Heading out early in the season can lead to the most success, Sandrini said. “A lot of times the first week or two, even if there’s snow, the hens haven’t dispersed yet and the toms can be pretty call-vulnerable.” Wait another week or two and the toms may have hens grouped up, which will make the male turkeys harder to call away. But if you couldn’t get out when the season opened earlier this month, there’s still hope. Often toward the end of the season, in mid-May, toms are wandering lonely and still searching. Avoid popular spots: This seems like an obvious one, but we find spots we like and then are reluctant to change even if other hunters are around. But research has also shown that gobbling will decrease through the season as toms grow more weary of hunters calling to them, Sandrini said. Don’t over call: Sandrini and Even stressed to be careful not to call too much. Even will call about every 15 minutes once he’s set up in his blind with a hen yelp or quick series of yelps and then will go silent. “If I get a response I will go off the temperature of the bird responding. If they’re quick to answer me, I will be quick to call back,” he said. “You’re advertising to jakes and toms that you’re in the area, but you can call hens in too, and with them you will get toms and jakes in.” Call too much too early, and you likely won’t hear or see anything. Sandrini will use a soft call if a tom is hanging up and not coming in, or even use a stick to scratch the ground to imitate birds feeding. Use decoys: Decoys, anything from thin, foldable outlines of turkeys to plastic, life-size bodies, can often be helpful. Try using a few hen decoys or even a jake decoy to bring in a jealous tom, said Sandrini and Even. But if you’re in a blind and turkeys are hanging up and not coming in, think about taking the decoys down. Occasionally turkeys will be reluctant to come into decoys and in the absence of them, might strut in close looking for a hen, Even said. Try using a blind: If you have a spot you know turkeys frequent, and you aren’t short on patience, consider setting up a blind. Turkeys are notoriously sensitive to movement and color, so giving yourself a place to wait that is completely concealed can give you the extra edge. It’s also key if you’re archery hunting for turkeys, Even said. Pay attention to vitals: For anyone thinking about archery hunting for turkeys, and for newbies with a shotgun, make sure you are close enough for a kill shot and can identify a turkey’s vital organs. Even has watched a turkey take off after an arrow has passed through because it missed the heart and lungs. Use a broadhead with a wide cutting diameter, and as with shotguns, aim for the head. A head shot generally either results in an instant kill or complete miss. 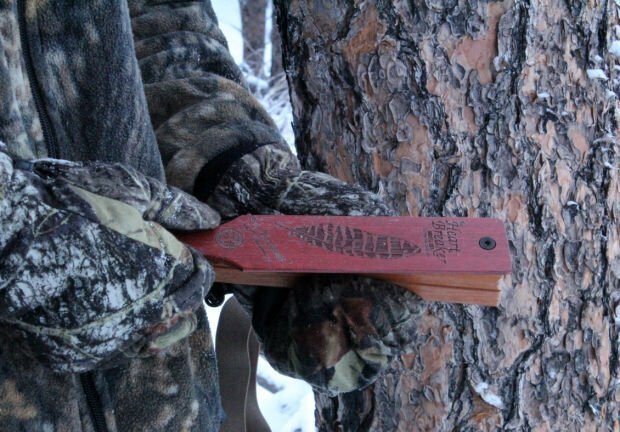 If you’re unsure where to shoot on a turkey’s body, reach out to a local Game and Fish office or hunting shop.